It has certainly been an amazing year for me this year. About a month ago I was notified that I was one of 10 cyclists nominated for the SBS People’s Choice Cyclist of the Year. To say I was honoured was an understatement. Along with names like Caroline Buchanan, Cadel Evans, Simon Gerrans and Richie Porte, I really did feel like a small fish in a very big sea! I was also nominated for Female ParaCyclist of the Year along with Alex Green and Sue Powell, both who had a great year as well. So last Friday night Russ and I put our best on to attend the awards ceremony which was being held at Crown Casino in Melbourne. I had decided that because it was a special night we would stay at the Crown Promenade. We don’t get to do this very often, so it was well worth it! I was also asked to present two awards that night the Elite Male and Elite Female Mountain Bikers (MTB) categories. And I was very proud to be able to present Caroline Buchanan with one of the awards she was to win that night. The winner of the Elite Men’s MTB category was Daniel McConnell from Victoria but unfortunately he couldn’t be there. I was also honoured to be awarded the Female ParaCyclist of the Year award and excited to have Simon Gerrans present my award to me! 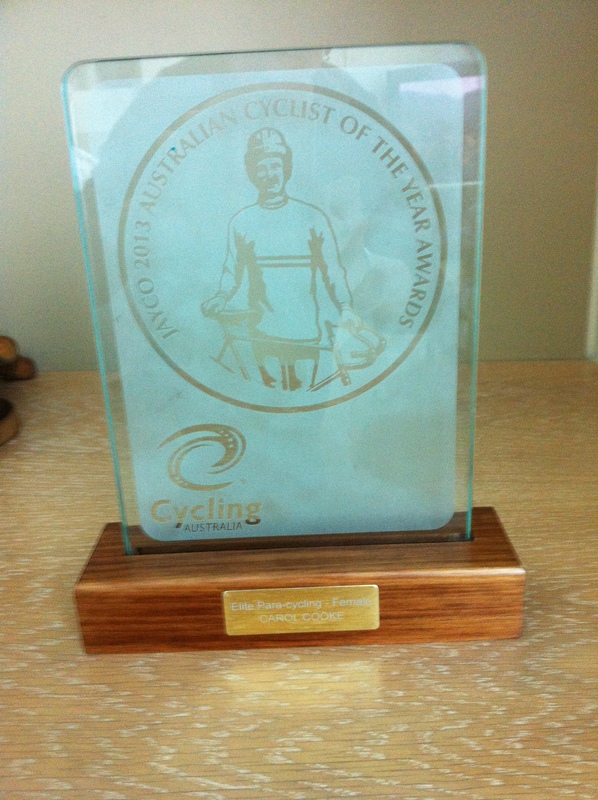 Thank you to all my family and friends who voted for me in the SBS People’s Choice Australian Cyclist of the Year. Although I didn’t win this I believe the award went to the most deserving in Caroline Buchanan. She also won “The Oppy”, Cyclist of the Year and in doing so became only the 3rd woman to win this title and the first BMX/MTB rider to do so. She is truly an amazing cyclist! Thank you to The Victorian Institute of Sport for believing in me, my coach Helen Kelly, my sponsors Liv/Giant and my family, friends and husband. Without all of you I wouldn’t be accomplishing what I have been able to do. I am very proud to be part of such a fabulous sport with some amazing athletes and incredibly supportive community, volunteers and staff that work so tirelessly behind the scenes. I look forward to a continued association with all of these people for years to come! THanks so much Aunt Marjorie! Wonderful achievements Carole, you are a marvellous role model. Have you ever thought of talking to kids at schools? Both Special Ed & Primary & Colleges! They would love you. Thanks Judy, yes I do speak at schools and have done heaps. I love it when the kids hold my London medal and it shows them that anything is possible! Yes I know Carol how the kids delight in seeing & touching the medal. Steve talks to Mackay’s (eldest grandson) class every year when he comes over to NZ and Mac is so proud! Well Carol, let’s hope next year will be as successful as this year. You have truly worked hard for all the awards received. Once again congrats from both dad and me. Awesome effort, Carol and so well deserved. You are amazing!